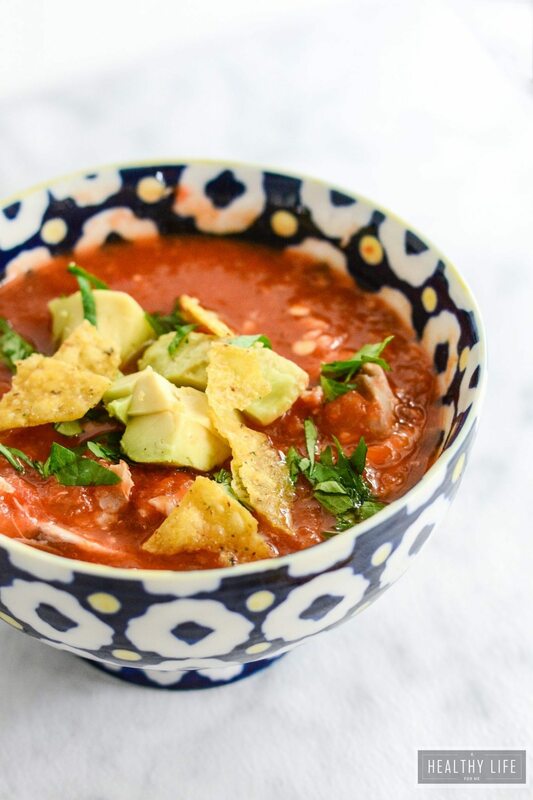 Chicken Tortilla Soup is a healthy and simple soup that has layers of fresh flavor. Gluten free, dairy free, soy free and nut free. Skip the tortilla toppings and this recipe is paleo friendly. 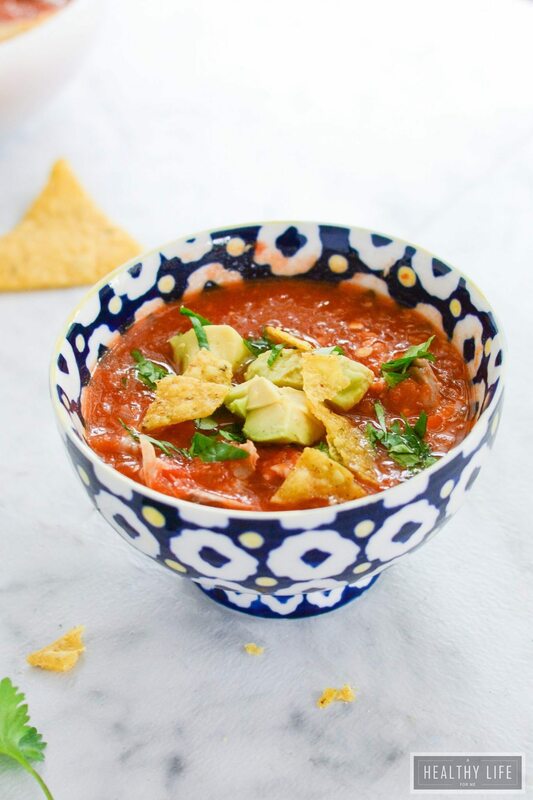 I love chicken tortilla soup, and always order it if it is on the menu at a restaurant. I think I love the fresh flavors that seem to be layered in every bite. With the end of the garden season and the last of my chilis and peppers being picked by the husband, I have been roasting, drying, preserving and chopping peppers for day. I though why not try out my hand at one of my favorite soups. I had chilis, fresh cilantro left to play with until I got the recipe just right. Unfortunately for my tastes testers the first pot was a bit too spicy, YIKES! This prompted me to switch from jalapeno peppers to hatch chiles. If you do not have access to hatch chiles, you can switch to 2 Poblano’s and 2 Jalapeno’s. Roast the Poblano’s according to directions below for hatch chiles, Jalapeno can be added raw and added when Poblanos are added. Just remove Jalapeno seeds for a milder flavor. 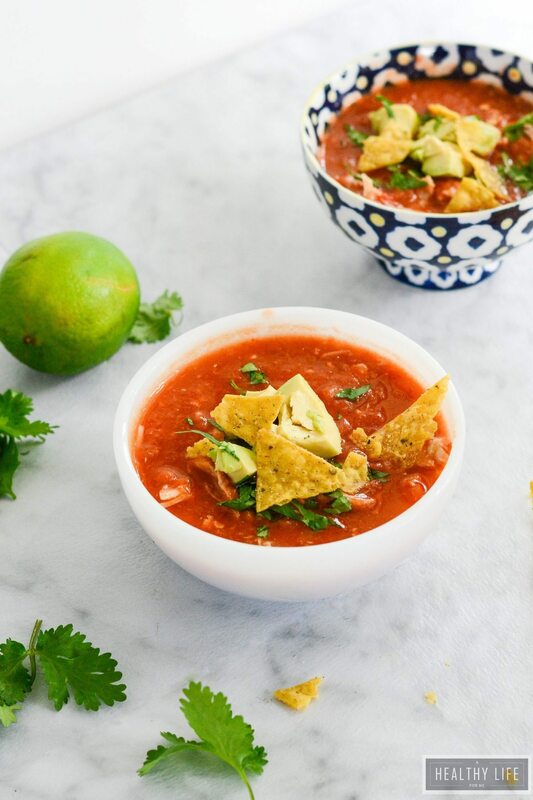 If you are gluten-free, there are several delicious gluten-free tortilla chips out there and if you are eating the paleo diet, skip chips they won’t be missed. Just add a bit more avocado to your bowl of soup. Place Hatch chiles on broiler pan and broil until chiles turn black about 5 minutes, remove, flip chiles and blacken other side. Remove the chiles from the broiler and place them in a paper bag, food-safe plastic bag, or heat-safe bowl. Close the bag or cover the bowl, and let stand for 10 to 15 minutes. The steam will help loosen the peel from the chiles. To peel, pull the skin off the chile; it should come off fairly easily, but you can use a knife to cut away any stubborn bits. Remove seeds and dice. Preheat a dutch oven over medium heat. Add remaining olive oil then add onions, cooking for about 3-4 minutes or until starting to soften. Add garlic and cumin, cook for another minute or two, stirring frequently. Add tomatoes, roasted chiles, chicken broth to pan and stir well. Allow to simmer for 10-15 minutes, then blend mixture well with a hand blender or use a blender blending in batches. Stir in shredded chicken allow to simmer for another 3-4 minutes. Stir in chopped cilantro and ladle into soup bowls.